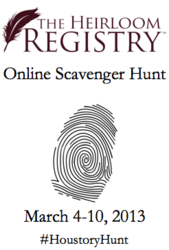 The Heirloom Registry™—a new product from Houstory®—is sponsoring an online scavenger hunt March 4-10, featuring a dozen popular family history, genealogy and antique blogs, as well as approximately $500 in prizes. Giveaways include the popular Flip-Pal® mobile scanner, as well as research services provided by professional genealogist Caroline Pointer. Approximately $500 in prizes will be awarded to four different winners during The Heirloom Registry online scavenger hunt, March 4-10. Highlighting the prize giveaways are the Flip-Pal mobile scanner and a Research Plan Package provided by professional genealogist Caroline Pointer, founder of 4YourFamilyStory.com. “The weeklong scavenger hunt will encourage readers to visit genealogy, family history, antique and family heirloom-related blogs they may have never seen before, and to try out The Heirloom Registry,” said Dan Hiestand, Houstory marketing director. Contestants will be required to visit each of the various partner blogs to obtain a special code. The code can be entered into The Heirloom Registry and will pull up a record that contains one of the “Words of the Day.” Every contestant that correctly contacts Houstory with the “Words of the Day” by the scheduled deadline will be entered to win the daily prize and be eligible for the grand prize drawing at the end of the contest. More information on the contest can be found at The Houstory Hearth blog. “We are excited to have so many great prizes donated by companies and individuals who share our belief in the power and importance of preserving family stories,” Hiestand said. The Flip-Pal mobile scanner is a battery powered, compact, lightweight and durable scanner that stores scans on an SD card. Diane Miller, Genealogy Account Manager for Flip-Pal mobile scanner, said the scavenger hunt is a great match for her company. "We at Flip-Pal mobile scanner are enthusiastic about giving people greater opportunities to easily capture and share their memories,” Miller said. “Sponsoring The Heirloom Registry Scavenger Hunt is a great pairing—not only to easily capture your memories—but then saving your scans in a safe place for future generations to use." Pointer’s Research Plan Package assists family historians in assessing research and research problems; developing a research plan; providing an actual research plan; and detailing next steps by providing suggestions on how and where to start. Pointer said it was a natural fit. 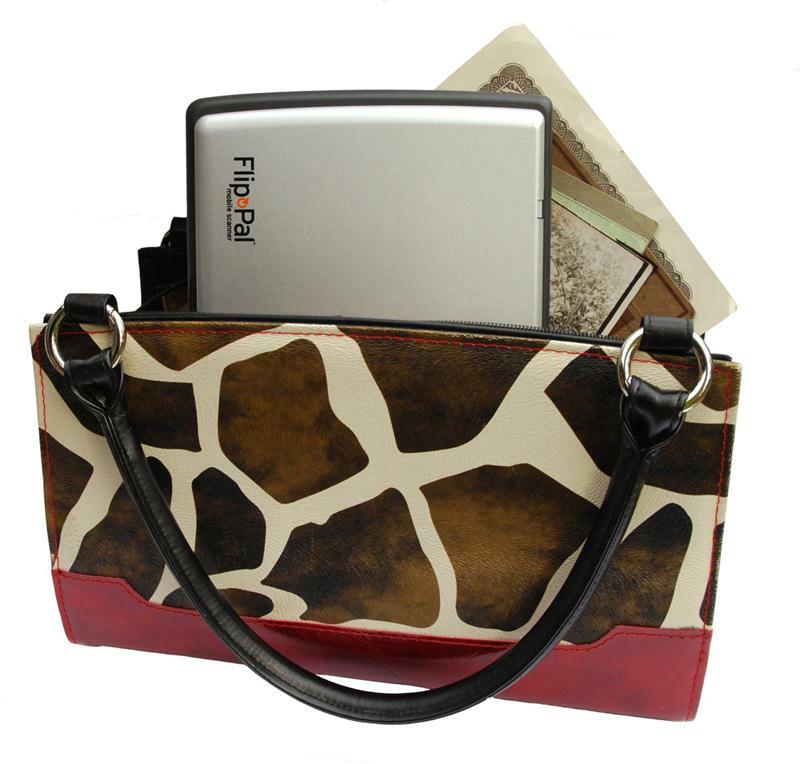 The Flip-Pal mobile scanner redefines photo and document scanning. With its patented flip-and-scan technology, the scanner is placed on an object, keeping it safely in place, rather than having to remove it from an album or frame. The Flip-Pal® mark is a registered mark of Couragent, Inc. The Couragent™ mark is a trademark of Couragent, Inc. Couragent provides patented solutions that solve everyday problems and are designed to be simple to operate so many can use them, and have a combination of benefits not available elsewhere. For more information, visit http://flip-pal.com. Caroline Pointer is a genealogist, a family historian, a writer, and a blog author. She has been blogging stories about her ancestors since 2009 on Family Stories. Additionally, she has been having epic results combining family history, genealogy, technology, research services, tutorials, and videos on her blog 4YourFamilyStory.com. When she is not blogging about dead people, coaching others on how to use technology to find dead people, or researching other people’s dead people, Caroline can usually be found in an antique store searching for letters, post cards, photos, books, etc. once owned by people who are now dead. When you record the history of a family heirloom, antique or collectible in The Heirloom Registry, its story travels with it. Wherever it goes. Always. In just 10-15 minutes, family stories and provenances can be safely preserved. It’s inexpensive and simple: Mark/label your item with a high-quality Heirloom Registry sticker, brass or aluminum plate, and share your items' stories in words and pictures at https://www.heirloomregistry.com. Once registered, those stories will be available to future owners, no matter where the item goes. The Flip-Pal mobile scanner is a battery powered, compact, lightweight and durable scanner that stores scans on an SD card. 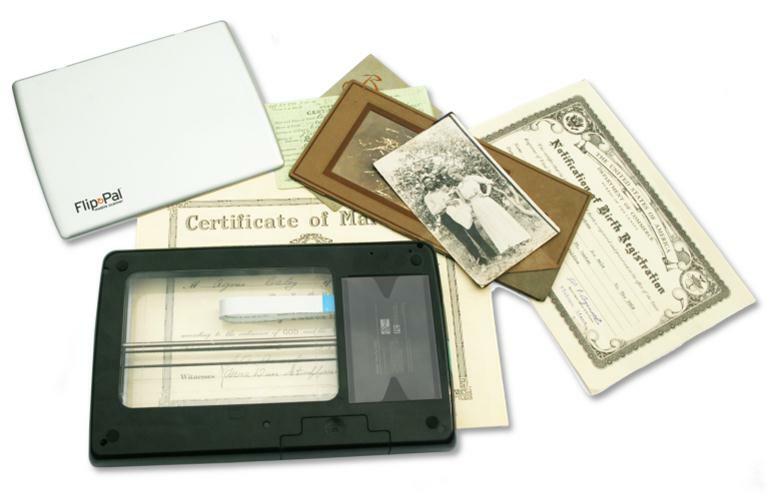 Scan your family history and family heirlooms with the Flip-Pal mobile scanner. Conduct your genealogy research on the go with a compact, durable Flip-Pal mobile scanner.